A new addition to the table summary, which has seen a few changes over the past couple of months, is that you now have the ability to filter them on the dashboard. You can do this on the go, without going into any settings or options. This new filter will always take any existing filters into account and is very easy to change as and when you need to, as long as your table summary contains categories to filter by. This type of dynamic filter becomes very useful if you need to drill down into your data and get a more detailed view of a specific category. 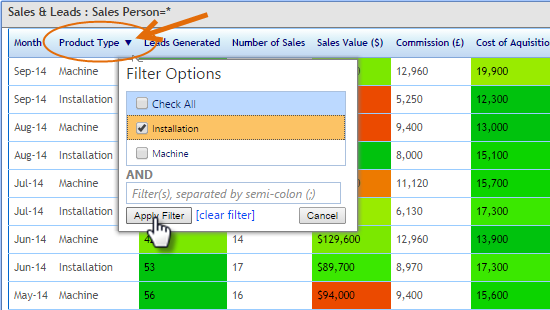 The filter can be applied to any number of categories in a table summary, and if you have several category columns, you can combine filters on several columns – just like you can in Excel. Is your data acting up? we&apos;re here to help! Almost all business data is complicated. It may contain many KPIs for different locations, departments, projects or people, and getting it into Target Dashboard in a format that works and does what you want can be tricky. That’s where Target Dashboard support and services come in. If you have a problem or a challenge in your data and reporting, let us know. We work with complicated data every day and we do it because we like it and we want your dashboards to be as good as they can be. We can help you format your data, build dashboards, write queries for the TD DataGrabber, or just give advice on what would be the best approach to a reporting challenge. Our team has years of experience with business data, dashboards and reporting, so just drop us a line on support@targetdashboard.com if there’s anything you need. Don&apos;t want dates in your table summaries? - No problem! Target Dashboard data and visualisations are based around dates. You always need to have dates in your data and all charts and visuals work around a date range. In some cases, however, you might not need or want to display any dates. This applies especially to table summaries where you might be showing long running projects, support cases or other date independent KPIs. That’s why we have enabled the option to hide the dates in your table summaries. 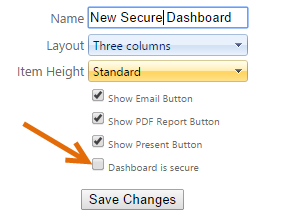 When creating a new dashboard, it’s important to remember to set the right permissions and security settings. To make this easier, we have added the option to make a new dashboard visible only to dashboard owners right from the start. This means you don’t have to worry about your dashboard being visible to other users while you’re busy building it. When your dashboard is complete you can give access to selected users, or turn on full viewing rights for all of your dashboard users.